We offer unpaid internships to printmakers who have recently graduated, upper level college students pursuing a degree in printmaking, or those who have completed a non-academic course of study in printmaking. There is no age requirement. 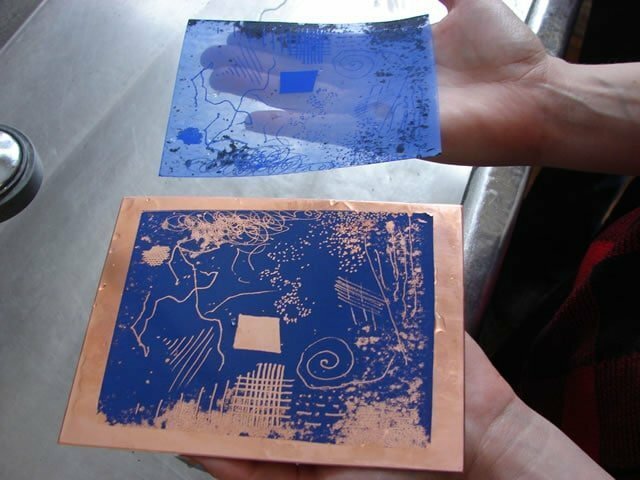 The primary role of interns at Zea Mays Printmaking is to do technical research into safer printmaking practices. The research is published on our website and has been presented at national conferences and one research project resulted in the manufacturing of a new product. Interns also assist with workshops, providing an opportunity to see the work done at Zea Mays put into practice. The internships are custom designed to suit the needs of the studio and the intern and to further the intern artist’s education. Internships are six months in length and are usually one day per week plus workshops. After the six-month internship, our interns receive a 6 month full membership to the studio to pursue their own work (valued at $1050). There are also opportunities for summer internships that work exclusively with our summer intensive workshops. We are looking for interns who have a knowledge of printmaking techniques (intaglio, relief and monoprint) and who have a special interest in safer and non-toxic printmaking practices. We really appreciate good communication skills, friendly personalities, writing and organizational skills, computer skills and all around good work ethic. Applications are reviewed and filled on an on-going basis. We are currently accepting applications for Spring 2020 and beyond. If you are interested in an internship at Zea Mays Printmaking, download the application form here, fill it out or transcribe it into an email and email it or snail mail it to : Zea Mays Printmaking, 320 Riverside Dr., Florence MA 01062.